The Business Continuity Institute (BCI) is the world’s leading institute for business continuity and resilience professionals. With over 8,000 members in 100 countries they make up a supportive community of resilience professionals. They join so they can share experience, learn from their peers, and find new opportunities. The BCI offer professional qualifications and a range of membership grades. They operate on an International scale and provide qualifications and events around the world. We were approached to undertake a test email campaign to a small section of their leads database to see if any leads could be converted and to make recommendations for a contact strategy to feed into a new CRM system they were planning to introduce to the business. We recommended an individual email approach rather than simply e-shotting the data repeatedly at volume. As the BCI would have the capability to engage via the CRM system into a “conversation” relationship with leads then this seemed the most appropriate. We also know from experience it would generate the most interest. The BCI set us up with an email account and we contacted individuals with a simple one line email - we haven’t heard from you for a while are you still interested in joining? It was as simple as that but our experience of membership organisations has taught us relationships are more important than volume of contacts. Treating people as individuals was very important for this project. The plan was to do a “three strikes and you're out” approach. So three personalised emails and if there is no response the data can go back into the general data pool for standard comms (such as newsletters etc). The leads supplied were a portion of the total data available and it was from individuals who had requested a general information pack about the BCI qualifications. 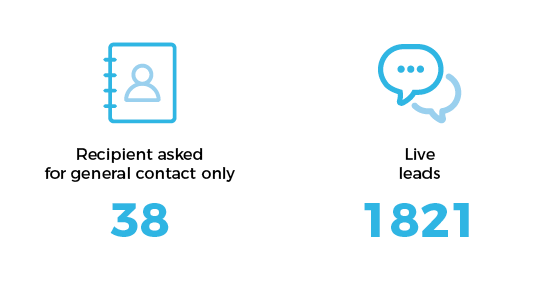 Of the total leads supplied 1,821 were considered to be “live” leads - we stripped out the broken emails and responders who either wanted to be deleted completely from the database or who just wanted newsletters and general emails. So of the live leads 1.9% joined or signed up for a qualification over the 4 months when we undertook the exercise. We contacted the data up to 3 times with a gap of a month in between contacts. We managed the responses - answering queries directly (where's my nearest exam centre, country specific contact details, how much do exams cost etc) or handed them off to staff at the BCI. If we went back and checked the database now there would be even more people that joined or signed up for an exam. Our exercise was done over a short period of time but the decision making process for something as involved as undertaking professional examinations can take months. 13% of the data responded to our emails and we are calling this a “positive outcome”. The vast majority of this 13% were people who wanted the BCI to contact them in a few months time when they were going to be in a better position to either join or take on a qualifications course. We also introduced a lot of overseas contacts to their relevant BCI country chapter if they wanted to join a local network. We gave the client the data file back with every single data item marked with an outcome including diary dates for further communication. We also fixed any broken emails we could. As well as the response rate/business generated we were able to give the client some recommendations for a contact strategy utilising the new CRM system. This exercise is a good illustration that marketing is often about persistence and simplicity and doing the basics. Data on your database will respond to the right contact but if you leave it untouched you're unlikely to get many sales from your leads. We also managed to get a couple of corporate sales leads - one of which turned into a five figure training project in the middle east. Whilst this was not the purpose of the exercise it's amazing what happens when you work your data but do it intelligently. Bombarding your data with multiple e-shots can work but generally you need to experiment widely to find what works for your business.